"I did something terrible Grace. I hope you can forgive me ..."
Grace hasn't been the same since the death of her best friend Charlie. She is haunted by Charlie's last words, and in a bid for answers, opens an old memory box of Charlie's. It soon becomes clear there was a lot she didn't know about her best friend. There was nothing she could have done to save Charlie ...or was there? As I approach the end of my short foray into the Blogging world I feel privileged to have read and reviewed some great books and this book is one of those that have made the Blog such a joy to do. 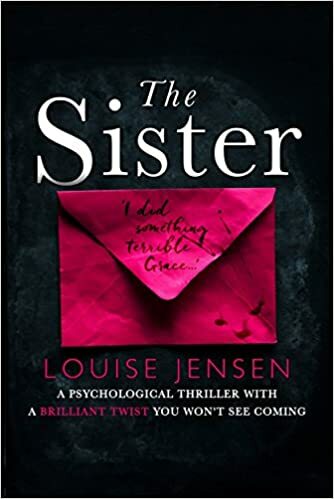 I have read some of the best books I have ever read this month and The Sister by Louise Jensen is firmly entrenched in that category. The story unfolds with alternating chapters of Then and Now. We are taken into the world of Grace Matthews, a world full of suspense, paranoia and damn right nastiness. I find it hard to believe that this a debut novel, Its enough to make established writers pack away their quills and get a ”proper” job. It’s a majestic novel that grabs hold of you tightly and doesn’t let you go, and you don’t want to be let go. I had to be reminded to breath by my wife on many occasions during this book. A literally breathtaking book, which will live long in my memory.